US President Barack Obama has ordered a review of the way intelligence agencies handled information over an army major suspected of killing 13 people. The measure comes after US intelligence authorities revealed they knew Maj Nidal Malik Hasan had been in contact with a cleric sympathetic to al-Qaeda. Thirteen people died in the attack at the Fort Hood military base in Texas. 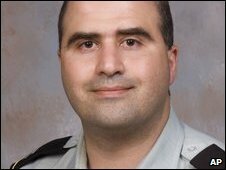 Maj Hasan, 39, was shot by police and remains in hospital. He has been charged with 13 counts of murder. He has not spoken to investigators. Maj Hasan was said to be unhappy about a possible deployment to Afghanistan. 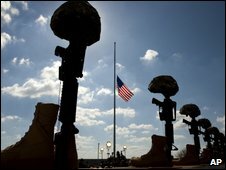 The shootings took place on 5 November at Fort Hood's crowded Soldiers Readiness Processing Center, where troops get medical check-ups before deploying abroad. At least 29 people were hurt in the attack. Maj Hasan has been under armed guard in a hospital since being wounded in the shooting. He is to be prosecuted in a military court. No-one has been executed under the US military justice system for almost 50 years, says the BBC's Matthew Price. Former military colleagues of Maj Hasan had voiced concern about his performance and attitude for a number of years, according to media reports. An FBI-led task force monitoring the e-mail of Yemen-based US cleric Anwar al-Awlaki said he had communicated with Maj Hasan - a US-born Muslim and army psychiatrist - on 10 to 20 occasions. However, it was decided that further investigation was not needed, as the content of the messages did not advocate or threaten violence. "I directed an immediate inventory be conducted of all intelligence in US government files that existed prior to 6 November 2009, relevant to the tragic shooting at Fort Hood, Texas, especially anything having to do with the alleged shooter, Major Nidal Malik Hasan, US Army," Mr Obama said in a statement. "Additionally, I directed an immediate review be initiated to determine how any such intelligence was handled, shared, and acted upon within individual departments and agencies and what intelligence was shared with others. "This inventory and review shall be conducted in a manner that does not interfere with the ongoing criminal investigations of the Fort Hood shooting." Amid fears of a possible anti-Muslim backlash after the attack, President Obama has stressed the multinational diversity in the US armed forces. "They are Americans of every race, faith, and station. They are Christians and Muslims, Jews and Hindus and non-believers. "They are descendants of immigrants and immigrants themselves. They reflect the diversity that makes this America," he said in the aftermath of the shooting.